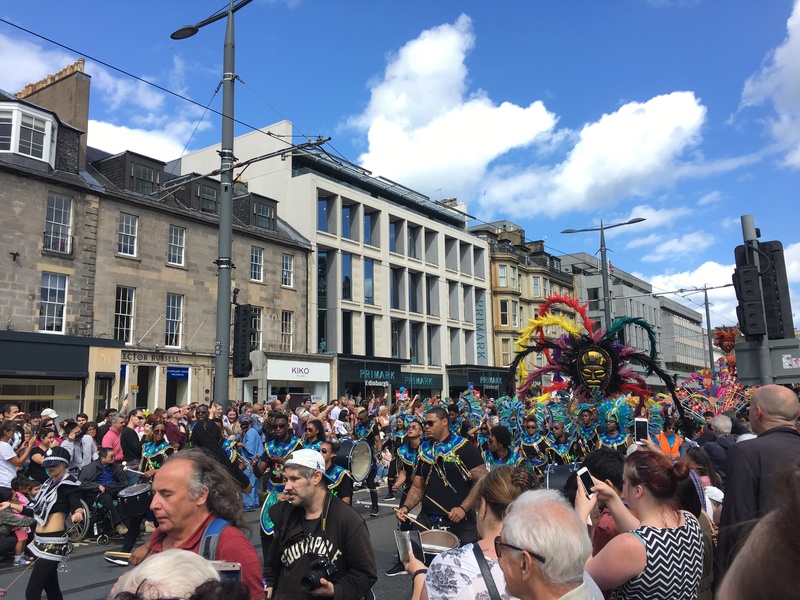 A carnival parade during the weekend of the Jazz and Blues festival. started our projects in our respective countries. It has been about 2 weeks since we landed in Edinburgh and within that time I think I can safely say we have all settled in nicely here. I must say I quite like the lifestyle here, although I guess it isn’t much different to the lifestyle in Ireland (my homeland) and probably why I fit in so well here! Despite this, I’m still getting used to some of the words they use here and a few of the countryside accents. 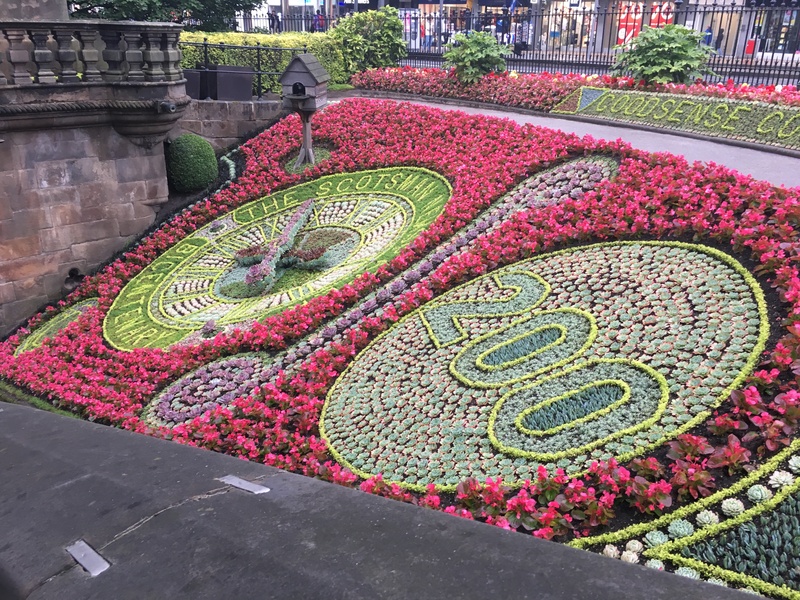 Flower displays in Prince’s street gardens. The display on the left is a working clock. For the few months leading up to this project I joked with friends and family about how I was going to be skipping the summer by living in Scotland for a few months. This (surprisingly) couldn’t be further from the truth! Granted, we have had a couple of days of dull rainy spells, but we have also had some great sunny days for exploring the city. Edinburgh is a great city to explore and to just go for walks in a random direction (you’ll always come across something cool). From Edinburgh castle to the gardens alongside Prince’s street to farmer’s markets selling all kinds of things and even a long beach to relax on, the city has something for everyone. Also one of the best decisions I’ve made since coming here is purchasing a bike and it is a nice way to travel to and from work. It allows you to take your mind of the day’s work and enjoy the weather (when it’s sunny) and the scenery. 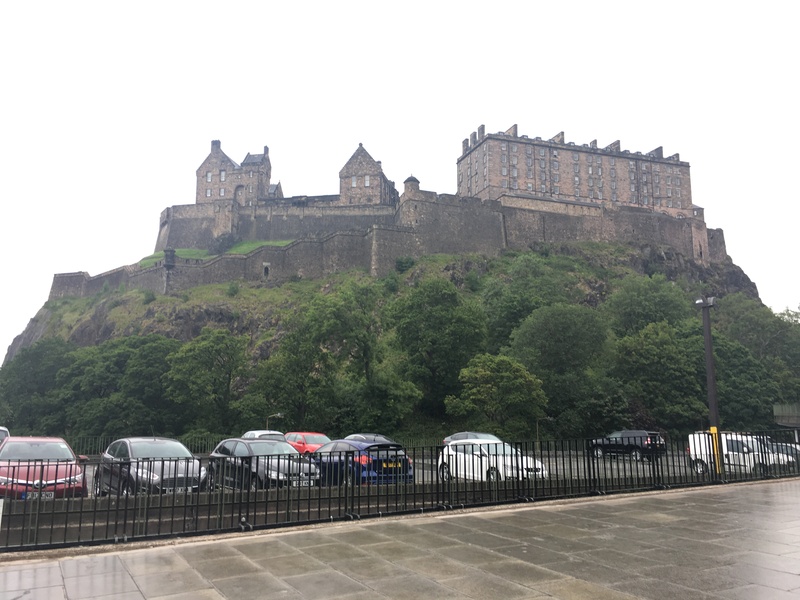 A view of Edinburgh castle from a car park that hosts the farmer’s market every Saturday. Now to the most important part of life in Edinburgh, the food. The fish and chips here are to die for, either from a restaurant or a take-away (chipper). It has always been one of my favourite meals and here is possibly the best I’ve had it (although the west of Ireland does it pretty good too). This is mainly due to the use of freshly caught local Haddock. However, this is not the only thing I’ve been eating (although I’ve had it more times than I’d like to admit) and Scotland has some other dishes to try out. The traditional breakfast here of bacon, sausage, egg, beans and black pudding is great. And when I mean breakfast, I mean the only proper meal you’ll need that day. And of course lets not forget the famous haggis, neaps and tatties which is surprisingly edible and pretty good if you ask me! I’d show you a photo of it but I was starving and ate it all instantly. Ok I’ve talked enough about Edinburgh, now it’s time to tell you a bit about EPCC. At this stage, the three of us doing a project here in Edinburgh have met our respective mentor and have began working on various codes. EPCC has welcomed us with open arms, given us a work space and access to their coffee kitchen (which is always needed) and been of great help to settle into life here (especially Ben Morse!). My mentor, Nick, has already been a huge helping me get started in modifying the visualization end of his MONC weather model and we have already met several times to discuss ideas, problems/bugs and goals. I don’t feel like there’s much point showing off Nick’s model as it wasn’t any of my work, so stay tuned for my next blog post where I will be showing images/videos of my progress on the weather model!